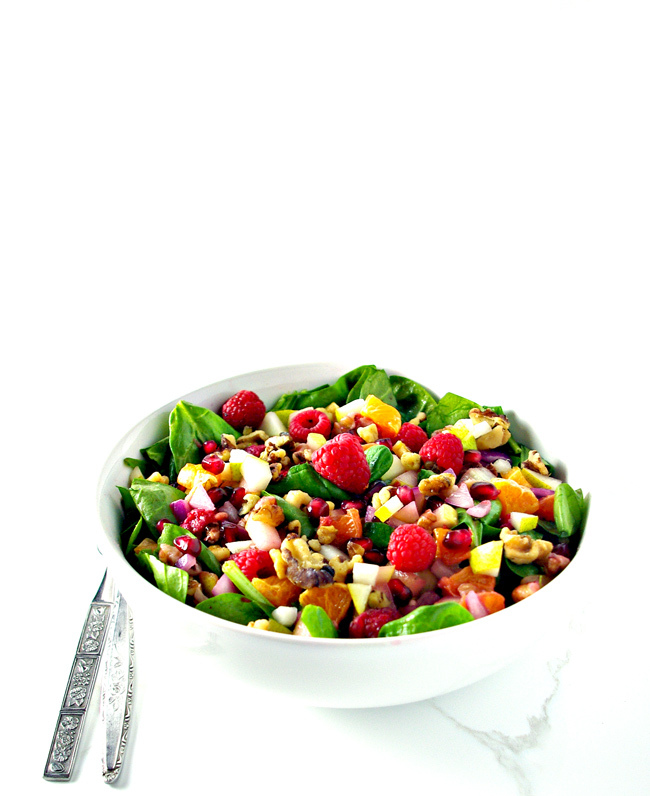 This Pomegranate Pear Salad with walnuts and a honey lime dressing is the stuff incredible salads are made of! It’s a delicious paleo salad recipe made with fresh ingredients, sure to please the masses! How do you feel about pretty salads that are full of festive flair? 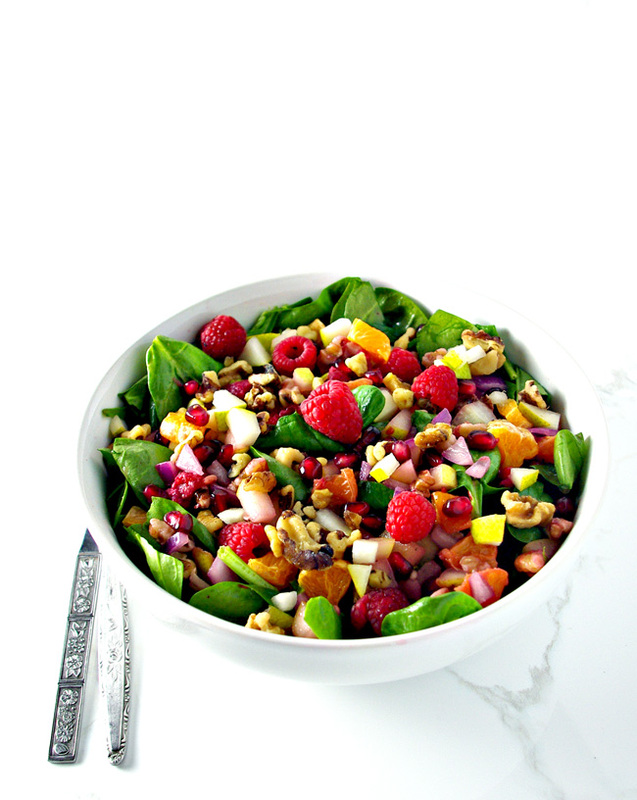 Like, let’s say this salad is full of citrus and berry flavors, onions (for a savory kick), succulent spinach, and crunchy walnuts, topped off with a honey lime dressing? Would you be all in for that? Because I totally am. 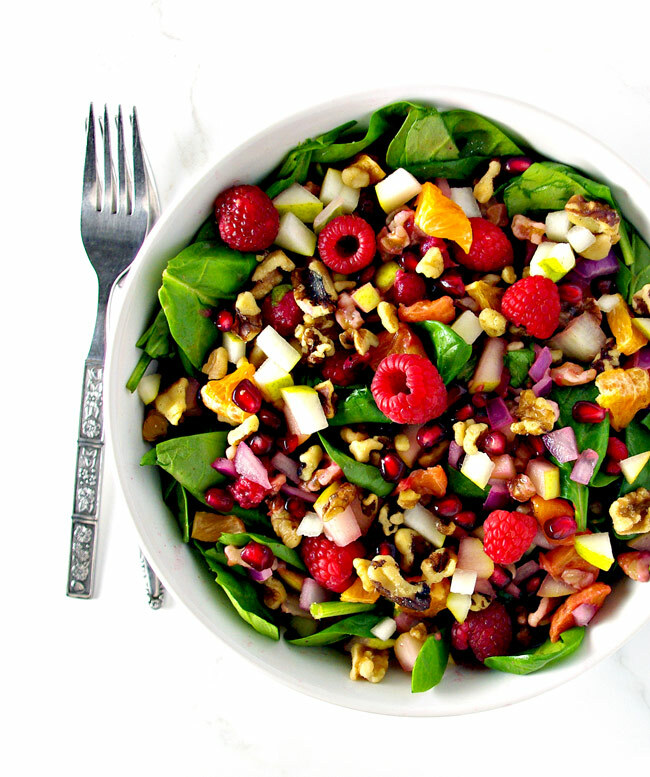 This Pomegranate Pear Salad is everything a cheerful salad should be! Pomegranate arils, raspberries, and mandarin oranges are my answer to what should we serve everyone during the holidays? And remember how I have an aunt who always has to remind our extended family to eat at least one healthy thing each holiday get-together? Bless that mess. She honest-to-God DOES have to remind us to include fruits and vegetables in our menu planning. Cheese, sausage, and crackers, it turns out, don’t actually cover all the food groups. Our family is still in its formative years, though, with some of us a wee 447 months old while a few others are in the neighborhood of 857 months old. They grow so fast. And also we never learn. 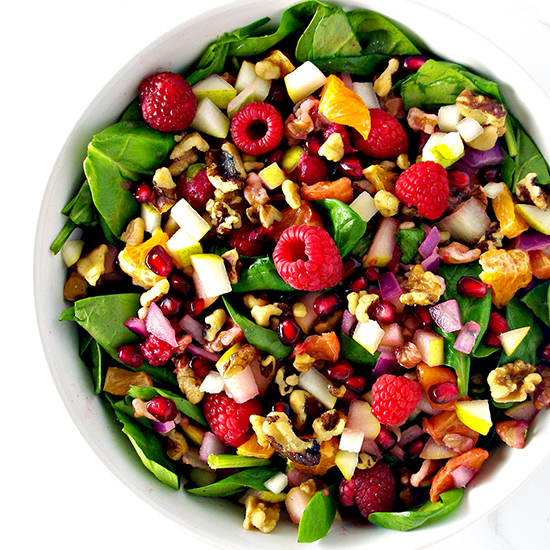 But this Pomegranate Pear Salad is a burst of color and flavor. It’s a recipe even the most “nutritionally ambivalent” (how’s that for a euphemism?) can get behind. Not to mention, you can adjust the sweet : savory ratio by increasing or decreasing the amount of each ingredient. I love being able to do that with recipes, especially if they are recipes I share beyond K-Hubs, Toodle, and Twinkle. Since everyone’s palate is a little bit different, it’s nice to have a flexible recipe customizable to the audience. So let’s get our festive cheer on and make it! Greens: Select a fresh, sturdy (not prone to wilting) green like spinach. The fresher the greens, the better. This salad is delicious, for sure, but doesn’t hide flavors that are past their prime. Fresh Produce: Pomegranate arils, ripe pears, mandarin oranges, raspberries, and red onions. Make sure the pears are ripe because, like the greens, you’ll notice if they aren’t. NOTE: If you are new to pomegranates and unsure of where to begin, then check out this tutorial from The Spruce Eats on How to Seed and Eat a Pomegranate! And if you fall in love with pomegranates like I have, then you might like this 3-Ingredient Cranberry Pomegranate Spread! First, chop up the leafy greens, if necessary, and then rinse them in a colander. Make sure to allow enough time for the greens to properly drain. Next, remove the pomegranate arils from the peel and set them aside. Then chop up the pears and red onion and set them aside, too. From there, slice the mandarin oranges the way you would a tomato, removing the peel so you end up with little slices of mandarin orange. They should resemble the pie pieces used in Trivial Pursuit. In a small dish, combine the juice of half a lime and the honey. Gently stir together. 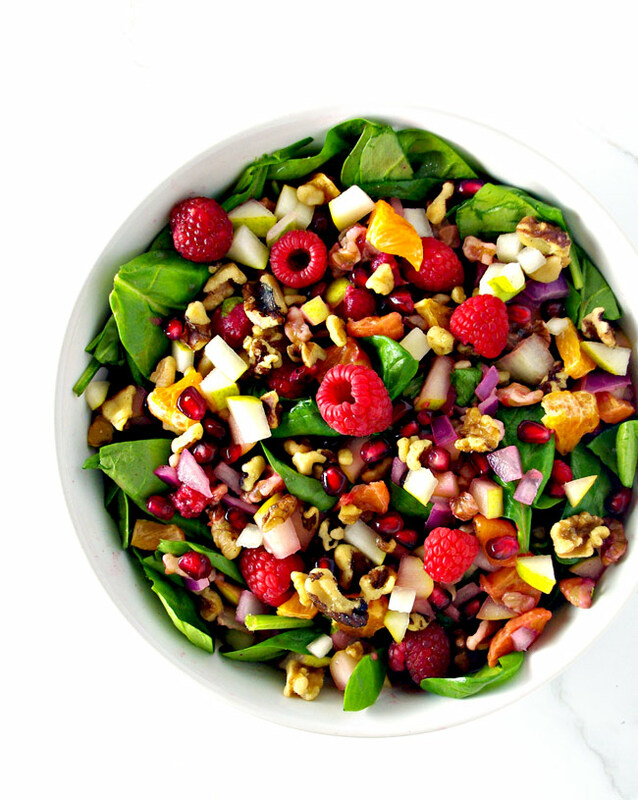 Finally, using a large mixing bowl, combine the leafy greens, fruits, onion, and dressing together. Top with walnuts, salt, and pepper. For a luscious, crunchy salad, it is best to keep the ingredients separate until just prior to serving. If your salad is too savory, then add a little more fruit, including extra mandarin oranges. I also find it helpful to add only half the chopped onion at a time, taste-testing before I add any more. If your salad is too sweet, then add a little salt and pepper to the mix, or a few extra pieces of onion. Because the fruit likes to stick to the honey mixture, I knead the salad ingredients together gently. If you are working with larger pieces of leafy greens (like large spinach leaves, for example), then instead of kneading the ingredients together (as above in #4), consider layering your plates or bowls with the greens first, followed by the fruit/onion mixture next, dressing after that, and finally the walnuts. That’s it! Prepping this salad couldn’t be easier! And it’s so gorgeously delicious, or deliciously gorgeous, whichever you prefer! Happy festive salading, Spiriteds! May your season be thankful, merry, and bright! Rinse leafy greens, drain them in a colander, and set them aside. 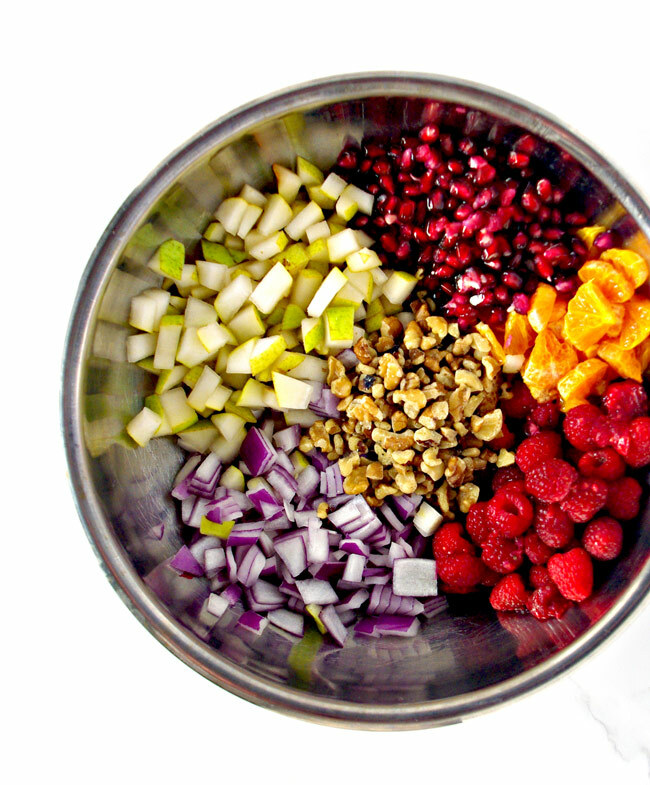 In a large mixing bowl, combine pomegranate arils, pears, mandarin orange wedges, raspberries, and red onion. In a separate dish, combine honey and lime juice. Just prior to serving, add the greens to the large mixing bowl with the fruit and gently knead the ingredients together. Stir in the honey lime dressing and top with walnuts. 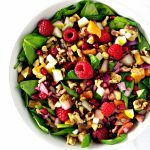 If using large leaf lettuce or spinach, then layer a serving bowl or individual bowls/plates with greens, top with fruit mixture, drizzle with salad dressing, and garnish with walnuts. Add salt and pepper as desired. For best results, enjoy this salad the same day it is prepared. Additionally, yield is an approximation.